OK, so it's not exactly a paid gig, but it's "work" for Murphy anyway. I usually use Teller for my trick pictures and when I need a thumbnail image of a pose for graphics work or illustration purposes. Teller jumped into the pool five minutes before I needed this picture, so Murphy - by virtue of being dry (mostly dry) had to be my model. This month's trick is "Sit in the Box" - it's back to a shaping challenge for Wagglers this month. Yes, the box is photoshop'ed onto Murphy's bum - out of necessity. 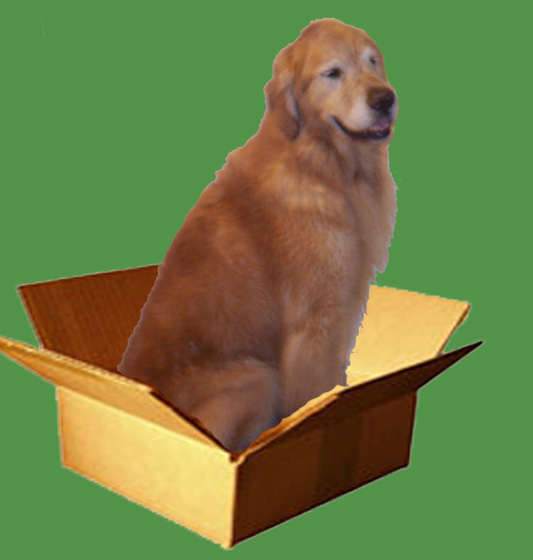 Would you believe we don't have a single golden retriever sized box in the house?